What is Malware Software? | How Malware Tool Works? Malware refers to any malicious software that is intended to cause damage or operational disruption to the host computer. It may also be used to steal personal or professional information by bypassing access controls in the host computer. There are many different types of malware in existence. Some of the common forms of malware are worms, viruses, Trojans, spyware, adware, rootkits, etc., which can attack and damage, disable, or disrupt host computers and networks. The overwhelming majority of malware programs are created to make money illegally, often by stealing sensitive and confidential information from victims' computers and mobile devices. 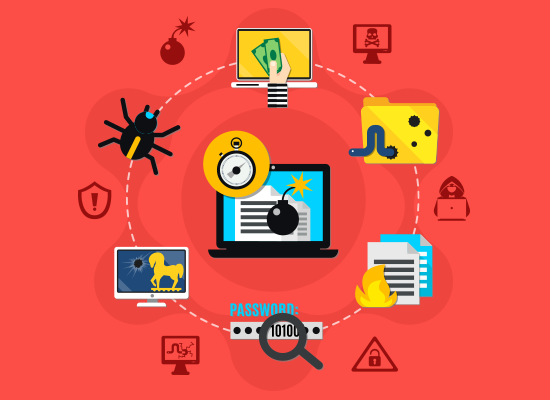 Malware can also be used to cyber-vandalism, cyber espionage, hacktivism, cyber warfare and various other reasons. Zero-day malware is designed by hackers who have taken advantage of a previously unknown vulnerability in the host systems or applications. Hackers design zero-day malware to target a specific security flaw (zero-day vulnerability) in a software application or host system and then use that malware to compromise the host system or cause unusual behaviors to occur on the software. The infamous WannaCry attack which disrupted several organizations and forced many to down their shutters is an ideal example of the security risks posed by zero-day malware. How Malware Infects a Computer? Malware can infiltrate your computer through various means, but the most common method is through phishing links and seemingly benign software downloaded from shady websites. Malware can get into your computer if you click on the links or open attachments from suspicious emails sent from unknown email addresses. Be it an average user or an organization; any computer user can be a victim of malware attack. If your system got infected with adware, it would bombard your computer screen with several annoying pop-ups which can't be closed at your will. If your computer gets infected with malware, it can slow down your computer and also corrupts your computer making it inoperable in some extreme cases. The best way to protect your computer and other devices from malware is to keep your operating system clean and up-to-date by downloading regular security patches and updates.